Air Heads, my new favorite candy of the week. Read below to see how thos relates. Thanks all for the words of encouragement through the tough times, I know I can always count on my blog family. "G" is just having a really hard time getting over the past. We had a brief but emotionally charged conversation last night prompted by me. He admits it's his issues with the past and his inability to get over it. Well ofcourse you can't get over I think, because you havn't even dealt with it yet. But hopefully going to talk together tonight and see what's up. Yesterday was tough for me so I tried to keep busy. After work I went to the barn and no one was there, which a rare. I heloed the barn owner do night chores and did all the hay feeding at the barn and watered the main barn. We chatted and hung out in the warm summer air and it was nice. The dogs got to play around and be stupid with each other and Possum got to be loose to eat greass while I was working about. After chores were finished we went to a woman's house who wants to give away her percheron mare and also throw in her TB who used to be really talented, but now he hasn;t done anything in a few years. His name is Danny, he's a solid chestnut about 16.1H but really cute face and athletic potential underneath no muscle and flab. I think she's gonna take them in because this woman wants to get out of horses. The percheron mare can be used in trail rides next summer and we're hoping to make Danny into a lesson/show horse. So I went home and my roomate was getting ready for bed so I talked to the dogs and watched some of the olympics and chatted with friends over texting. "G" and I then had our conversation and I still couldn't sleep so I ate Air Heads the candy in bed and then waited for sleep to come. 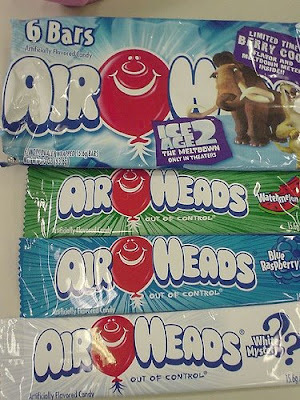 I love air heads, my favorite is the blue raspberry and then white mystery. Pretty much a tie for the cherry and strawberry and the green I usually give away cause I hate them. Their so chewy and packed with sweet goodness. I really do need a life if my biggest excitement in bed is eating air heads that's pathetic! Have a busy day today, but have gotten a lot done already. No real plans this weekend. I may on Sunday go to a local little show and route one of the girls from the barn on. I can bring the dogs and it's a pretty little place and they also have food. I have the wedding Saturday of a co-worker which "G" was planning on going to with me, but not now, so I have to go stag. I asked my friend if I dressed Phineous (my dog) up if he could be my date, she looked at me funny like I was joking. But secretly I wasn't. SO I'll go alone and try and have a good time and see happy couples, *sigh* it's so hard time sometimes surrounded by happy people with few problems, I'm just waiting for my turn. It'll come I know. SO have a good weekend everyone and good luck at shows and any other horsey related activities. I'll def get a ride or two in with Possum as well, thinking about riding tonight if the weather holds out. Keep the encouragement and positive thoughts coming! Just had a few moments to stop by - read your other post. Sorry he's being crappy, but you are not pathetic! I think the most interesting people can be find amazement, and enjoyment out of the smallest things. I too will sometimes find something seemingly insignificant amazing and cool. You and I would never go crazy if we were ever held hostage in a small room for a long time because we can keep our mind busy on small things. I am so freakin tired right now...getting ready for even a small show is just wears me out! Well gotta go! Smile today - wish me luck!